Hanging lockers are notorious space hogs. 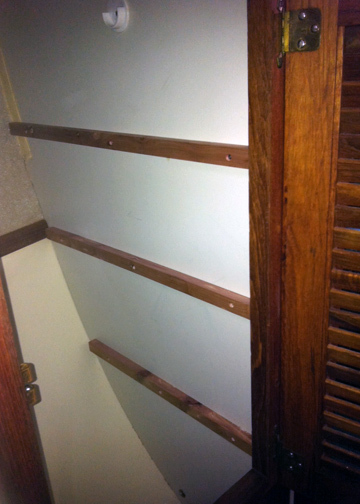 In ours, there was so much wasted space, especially in the back, that we turned them into shelves. While a multi-weekend process, with lots of back and forth from the boat to the shop, it was well worth it. 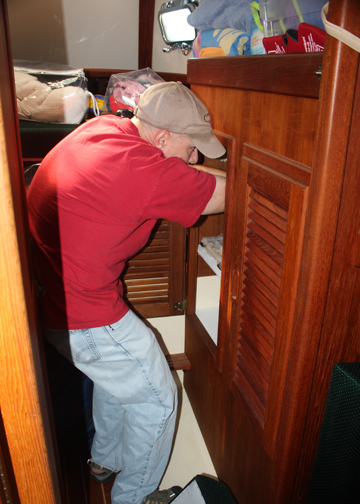 This is the forward hanging locker near the v-berth. There are 3 shelves per side, each made of painted marine plywood and secured to cedar brackets. 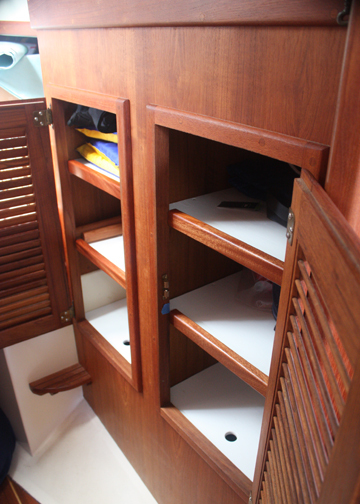 The lower shelf contains a pull hole to access the items stored underneath. We purchased plastic flexible zippered bins from The Container Store for items requiring ready accessibility, and will add vacuum sealed space-saver bags in the hard to reach back areas. I have designated my side the right (aft) side as it is the largest, of course. As this is all the space I get for clothing, it's going to be difficult to pare down! 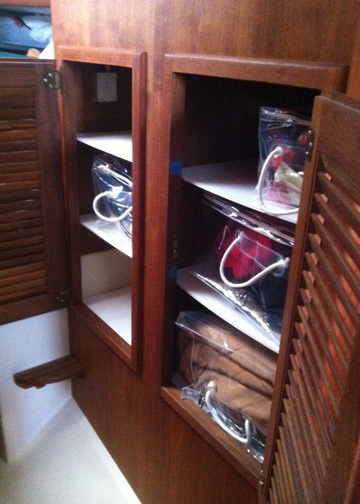 We also decided the aft hanging locker under the chart table just wasn't big enough to be a real wet locker, and we will hang wet items up in the head instead. 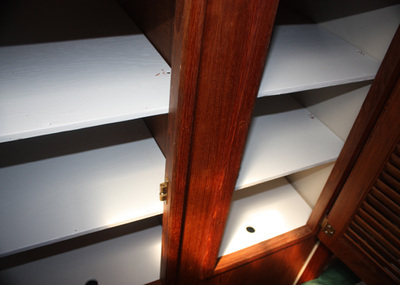 So we made shelves for that locker as well. 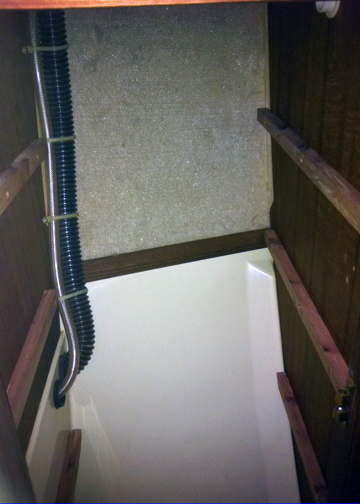 We will designate it a pantry and add hard plastic bins to slide in and out. 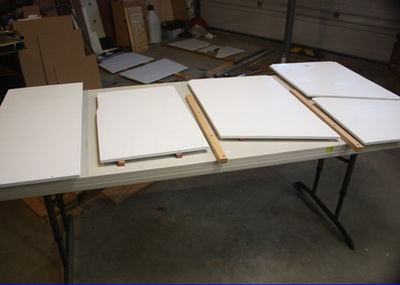 We cut thick posterboard for each shelf size and used as templates to trace onto the plywood. Shelf test. 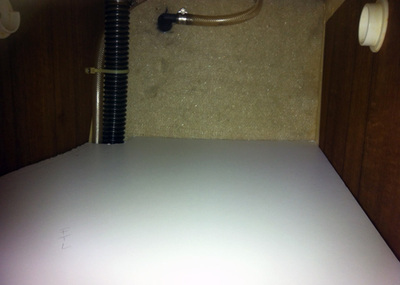 These look like the real shelves but the thick postboard actually held my bins very well. 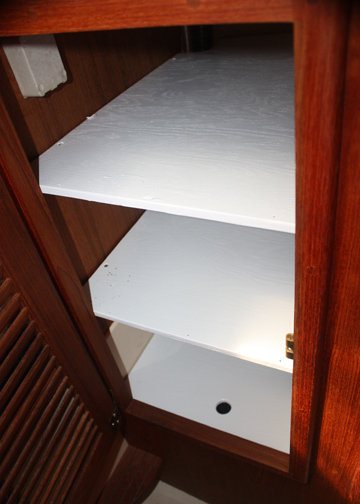 Marine plywood shelves, painted white. Drilling the plywood shelves into the brackets. 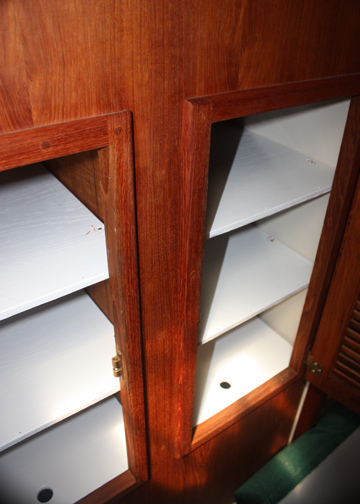 Each bottom shelf is not secured. They have pull holes to get to the lower area where items like my vacuum cleaner will live.